Shocking how Her Thighness would refuse to answer questions, isn't it? Unless it's scripted, she isn't talking. As she races through Iowa in the days before next week's caucuses, Hillary Clinton is taking few chances. She tells crowds that it’s their turn to "pick a president," but over the last two days she has not invited them to ask her any questions. Before the brief Christmas break, the New York senator had been setting aside time after campaign speeches to hear from the audience. Now when she’s done speaking, her theme songs blare from loudspeakers, preventing any kind of public Q&A. She was no more inviting when a television reporter approached her after a rally on Thursday and asked if she was “moved’’ by Benazir Bhutto’s assassination. Clinton turned away without answering. Yeah, she's ready to be President. Maybe of the local PTA, but not the United States. 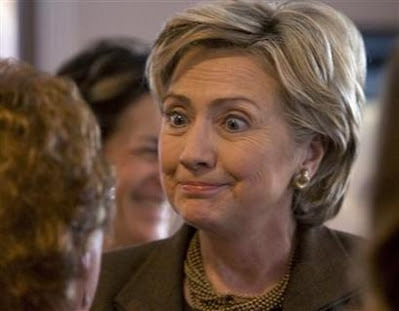 Meanwhile, she's in a three-way statistical dead heat with Silky and Barry O in Iowa.